Even a novice gardener knows that soil needs to drain well for plants to thrive. What most of us don't know is how to measure the drainage rate of our soil - or what that rate should be. You can assess the drainage rate of your soil quickly and easily with nothing more than a large can and spade. Remove the top and bottom of a 46-ounce aluminum can. You can typically find these cans in the juice aisle of your grocery store. Did a hole to a depth of four inches in the area where you wish to assess the drainage rate. Insert the can in the hole. Back fill around the can with fresh soil, pressing it against the can to secure the can in place. Fill the can to the rim with fresh water. Measure the amount of water that has drained through the bottom of the can in one hour. The water level should drop approximately two inches in well-drained soil. If it drops less than an inch, your soil is likely to become waterlogged after rains. If the water drops more than four to five inches, your soil drains too quickly. 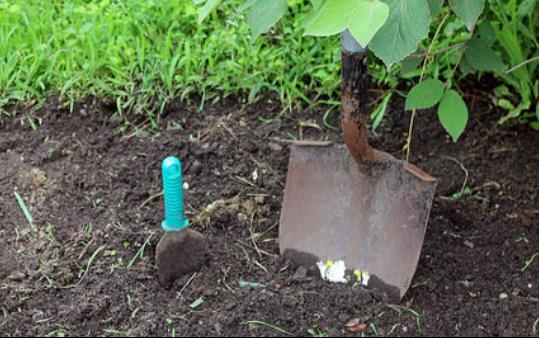 To correct soil that drains poorly, dig and loosen the soil to a depth of eight to ten inches. Dense, compact soil does not allow water to penetrate and cannot drain properly. This is often the result of soil compaction or high clay content. Adding organic matter improves the texture and promotes good soil drainage. If the area is sunken, build the soil up to a slighted raised mound to prevent water from collecting in the area after rains. Ironically, the solution to soil that drains too quickly is also adding organic matter. This improves the water-holding capacity of gravely or sandy soil. Good sources of organic matter include compost, aged manure or leaf mold. Work it in well with the existing soil with a garden spade or garden tiller. Test the soil in all areas of your yard for drainage before planting as considerable variations can exist within your yard. For severe problems with drainage, add organic matter to the soil in the fall and allow it to work its magic as microbes go to work improving the soil.